How do you like your peace and tranquility? Spring and Summer beg you to throw open the doors to all of the porches, grab your morning coffee and let them give you a brilliant, rivaling show of the sun rising. Not to be outdone, sunset beckons you to sit center stage, with your glass of wine in hand, while it thanks you for another glorious day. Like blueberries? Weâ&#x20AC;&#x2122;ve got them. Want to have the blueberries work for you? We can handle that too with 30-acres of them providing income. 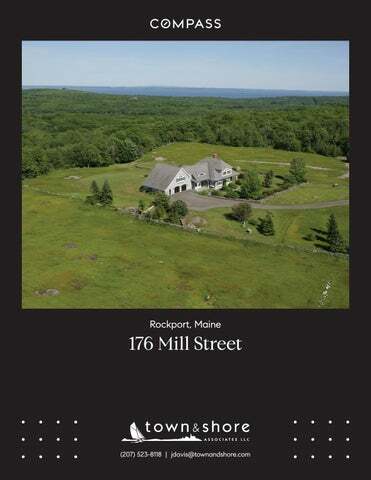 Why go for oceanfront when you can have Penobscot Bay views and enjoy acres of rolling, lush hills? If Mother Nature had another home, this is it! What memories can you make here? The property has rural zoning registered as farmland, lowering taxes. For more information or to request a virtual or private tour, please call, Skype or email me at 214.505.4289 or Angela.Downes@Compass.com Co-listed with Jeff Davis, Town & Shore Associates 207.233.9423, jdavis@townandshore.com. • We overlook over 6,000 acres of undeveloped land to our immediate south. The Rockland Bog is open to all with hiking, ATVing, snowmobiling, and horse trails. • A relatively new YMCA with all of the latest equipment, indoor track, pool, and climbing wall in Rockport village. • Multiple	public	gym	facilities	in	the	area,	including	the	Samoset	and	Gold’s	Gym	that	are	open to the public. • Camden Snow Bowl (camdensnowbowl.com) features beginner and intermediate slopes. Also home to the U.S. National Toboggan Championships. • Ice skating on Chickawaukie Lake and Megunticook Lake, both just a few miles away. Chickawaukie	also	has	ice	sailing. Both	lakes	offer	ice	fishing. You	can	also	skate	right	next door	on	the	Smiths’	pond. • Cross-country skiing and snowshoeing at Camden Hills State Park and the Rockland Bog. • Hiking and climbing (yes, ice climbing) in Camden Hills State Park. • Indoor tennis, ice skating, and ice hockey facilities on Route 90. • Kayaking and rowing shells on the ocean and Megunticook Lake • Schooner sailing cruises and charters out of either Camden Harbor or Rockport Harbor. • Maine	Sport	Outfitters	and	Outward	Bound	are	local	and	offer	various	classes	and	excursions. • 100 miles of groomed interconnecting trails from the local coast up to Frye Mountain for ATVing and snowmobiling. • Bay Chamber Concerts hosts internationally renowned musicians and dance troupes, and offers a variety of music lessons. The Chamber has hosted everyone from Pavarotti to the Celtic	Dancers. The	executive	director	and	founder	of	the	Chamber	lives	across	the	street. The	Chamber	is	a	very	active	organization	engaged	in	benefit	activities. • A variety of music schools and private instructors in the area offer lessons in everything from piano to bagpipes. • Numerous art galleries, including the Farnsworth (the Wyeth collection) and the Center for Maine Contemporary Art. First Friday Artwalks take place every month amid the downtown art galleries. • An	extensive	adult	education	program. • The annual Camden Conference (camdenconference.org) and PopTech draw world leaders from around the globe. • Home to the world-renowned Maine Media College, providing year-round programs and workshops	in	filmmaking,	photography,	design,	writing,	and	book	arts. Maine	Media’s	MFA program	was	recently	named	to	the	top	100	fine	art	graduate	schools	by	US	World	&	News Report. • Sailing lessons and courses available locally. • Center for Furniture Craftsmanship (woodschool.org) offers classes in everything from basic furniture	refinishing	to	building	high-end,	museum-quality	pieces. They	offer	different	lengths	of classes	from	daily	to	long	sabbaticals. Executives	from	all	corners	of	the	world	enjoy	the	escape to Maine and frequently participate in sabbatical programs. • Flying lessons at the Bald Mountain Airport. • Owls Head Transportation Museum (owlshead.org) offers a world-class collection of antique autos, aircraft, and more. Frequent events. • Very	active	area	for	benefit	events	for	organizations	like	Habitat	for	Humanity,	the	Make-A-Wish Foundation, and more. • Lessons in ballroom, ballet, swing dancing, and more through various studios in the area. • Camden’s	Hartstone	Inn	features	a	variety	of	weekend	cooking	classes	(hartstoneinn.com/ events). • Many	exceptional	and	diverse	cuisine	restaurants	in	the	area	with	CIA	(Hyde	Park)	trained	chefs and James Beard Awards. A local restaurant even beat Chef Bobby Flay in a slap-down over lobster rolls. • Grocers:	Hannaford	Supermarket,	The	Market	Basket. In	nearby	Portland,	you’ll	find	Whole Foods	and	Trader	Joe’s. • Get your organic groceries at Fresh Off the Farm Co-op (about 2 miles directly east of the home), Good Tern Co-op (Rockland), Belfast Co-op, Rising Tide Co-op (Damariscotta). • Cellardoor Winery in Lincolnville and Cellardoor Winery at The Point in Camden offer public events and tastings (reservations required for tastings), and are available for special events. • Savage	Oakes	Vineyard	&	Winery	is	open	daily,	offering	tastings	and	both	self-guided	and guided tours. • All Creatures Veterinary Hospital—Dr. Mimi is a small and large animal veterinarian. This is the closest vet to the property, located at the bottom of the hill (allcreaturesvetme.com). • Rockland Animal Hospital—Dr. Phil specializes in small animal veterinary care (rocklandanimalhospital.com). The Caldwell Residence is a fine example of the best of Maine architectural talent mixed with the Maine craftsmanship that completes the construction of these masterpieces. The house was designed by Maine Classic Architect Chris Glass and built by Taylor Martens of Rockport who has a resume that includes many of the finest houses in the Camden/Rockport area of the mid-coast of Maine. Taylor used the best subcontractors in the area for this house as is evidenced by the attention to detail from the electric panel to the Master Bedroom window and door trim. To insure the long life of this fine house, the Caldwells have meticulously maintained all this detail and invested in improvements as they arose during their period of stewardship. The house now needs minor maintenance and updating of insulation thicknesses. Heat is provided by twin Weil Mclean boilers, which are the original units. They are set up as a lead lag duo meaning that they work alternately as heat is called for in the system and will additionally work together in times of increased need, i.e. very cold weather. There are 8 zones off these boilers, which are driven by a single circulator with zone valves to control branch distribution. There is a small boiler mate hot water tank on the second floor, which is heated by the main boiler and provides quick hat water to the baths, which are distant from the main boiler. There is an additional manifold system with four circulators located in the garage that serves the garage and areas at that end of the house. The heat is also provided by the main boiler. Heat in Master Bedroom by fan actuated toe kick unit. Domestic Hot Water (DHW) is stored in an 80 Gallon Amtrol in the basement located near the boiler. This is more than adequate to serve the needs of the house and the large whirlpool tub. This complete heating plant was installed by Jims Burner Service at time of original construction and the owners have had them maintain it yearly since then. This company is one of the best mechanical contractors in the area. Fuel tanks are in the basement area and are connected to the boilers with tubing properly sleeved and inset into the concrete floor to remove trip hazard and abrasion. Fuel consumption is 1500 gals/year as reported by owner and can be confirmed by Pen Bay Oil. Service is underground from the CMP transfer box across the driveway from the house. The 200-amp service is provided by an aluminum main feed with copper wire at all internal house branches. Workmanship is of the highest quality and consistent with all standards of practice. There are three conduits from the transfer box location into the basement at panel location. Standby power is provided by a 14 KW generator located on the east side of the garage and powered by propane. This was not tested at time of inspection. This generator is programmed to start every week at the same time and run for 15 minutes. The weekly test is monitored by the security company and the owner is notified by phone if it fails to start. Reported by the owner, this generator runs everything except the electric dryer. There is an exterior generator connection at basement entry, which is no longer used. Cable is underground with a signal booster. Full security system installed and monitored by Pro Tech. Contact Mike Gay on his cell 207 542 9007 for more detailed information. House is protected by lightning rods properly installed to ground. Full copper throughout. All bath fans are remote Fan Tech units. With remote location, sound is minimized at penetration point. Fan Tech is a very high quality appliance. Reported by owner, system has 1000 gal tank that has been recently pumped. There is an inline filter that is on a biannual schedule for cleaning. Access is on the east side of the house and is accessible at ground level through risers and caps. The basement currently has a copious dog bath at the location that is plumbed for a full bathroom. Washer and Dryer are located in the basement in a separate room with floor drain and accessible shutoff. Water treatment system is in the basement treating for manganese and adding dissolved oxygen to offset for acidic conditions. Backwash is going into floor drain. Specific questions can be answered by Mike Eaton at Brookside Plumbing. Well is 300 feet deep and produces 40 Gal/Minute. Work sink in by water treatment system is not connected. Waste line to second floor is lead covered to minimize water noise. FOUNDATION  Foundation hole was blasted into solid rock and this same rock was crushed and used for sub slab interior drainage material and perimeter drainage material up to grade. Foundation footings are on rock. Foundation construction by MacDonald.  Field stone veneer is supported by foundation shelf. INSULATION  Basement wall insulation is Corebond foam in 2x6 cavity filled to 4 inches. Ceiling is not insulated. (Basement temperature maintained at 55 degrees) Rim joists spaces are each foamed to an estimated depth of 4 inches.  Main House wall insulation is dense pack cellulose as reported by owner.  Floor is insulated between 1st and 2nd floor for sound.  Attic is insulated with loose cellulose to an average depth of 8 inches. Correct rafter bay venting is in place as is ridge venting which is underlaid with air permeable membrane. No evidence of moisture accumulation. Attic insulation on SE corner has been disturbed by wind and should be checked to make sure rafter venting is in place and that insulated duct from bath vent is properly attached to the exterior vent. Insulated ducting connecting guest bath to east side vent is detached and should be reattached to avoid moisture in this space.  Garage attic floor/bedroom ceiling is insulated with dense pack cellulose below the subfloor. Guest bath vent is in place and is not connected, as there is no shower. House was built by Taylor Made of Northport known for their minute attention to detail in both framing and interior trim. All visible materials are of the highest quality and constructed to high levels of craftsmanship. Windows are by Anderson Vinyl Clad Casements with upper and lower sash locks to minimize air infiltration. Grills are snap in. Windows have UV film. Ceilings are skim coat plaster. There is wall framing in walls for flanking windows in the south facing Living Room wall. Doors are by Anderson and have double locking systems to minimize air infiltration. Siding is Eastern White Cedar shingles, which are in good condition. Roofing is 30-year asphalt architectural style shingles. This is in essence a double coverage system, which eliminates the weak element of older slotted shingles. New shingles have been installed on the east side of the garage valley as a result of ice damming in this most recent winter when caretaker did not rake this valley. This was reported by owner. There is no interior ceiling evidence of water penetration from this roof damage. There are other locations on the roof that show evidence of this same condition and should be replaced and the lower roof sheathing examined in the process. Considering the high wind environment of this house, these shingles are in good shape and probably have another 10 years f life. Copper flashing and valleys throughout including the overlapping chimney flashing which is another example of attention to quality construction. KITCHEN  Finishes and surfaces in good condition.  Floor in good condition  Appliances operating. GARAGE  Finished and insulated space.  Thick insulated overhead doors with openers.  Heating manifolds are in this heated space and would need to be protected if this space was not heated. GRADE AND DRAINAGE  Grade is away from the house.  Drainage stone at surface goes to footing as reported by owner EXTERIOR  Wood trim is in very good condition Pictures attached in separate file are for visual reference.